Today marks 13 days out till my due date (pardon me, it’s Thursday as I write this and it’ll post on Friday, so 12!!!). I know I still have a good chunk of time before Cecelia makes her appearance. In fact, I love to guess stuff like that so, I’m still guessing April 28 as the day I go into labor and I’m also guessing 7.5 lbs and 20 inches long with lots of brown fuzzy hair. 😉 Ohhh…so that puts me 8 days out! WAHOO! It’s hard to be in the in-between times of life; especially when something exciting is coming soon. Our Pastor was talking last week about how we view daily life and I love something he said: He gave the example of how whenever you have something special coming up, like say a big vacation, anything that happens the week before tends to roll off your shoulders because who cares? This time next week you’ll be on a beach sipping something with a little umbrella in it! He said that we are less bothered by the inconveniences of life; we are often more forgiving and even more kind leading up to times like that. Now, his application was that as people who love and follow Jesus, we should live our life like that everyday because of what awaits us in the next life. I loved that and it was very convicting. However, I feel like the Holy Spirit is telling me to calm down. My sweet doula encouraged me to lengthen my perspective down into eternity. This time is a blip on the map. So I’ve been greatly encouraged by that and wrestling with my own heart and expectations as I wait. I can’t and shouldn’t start a new pet project. Therefore linen closets get expertly organized. Carpets get shampooed. 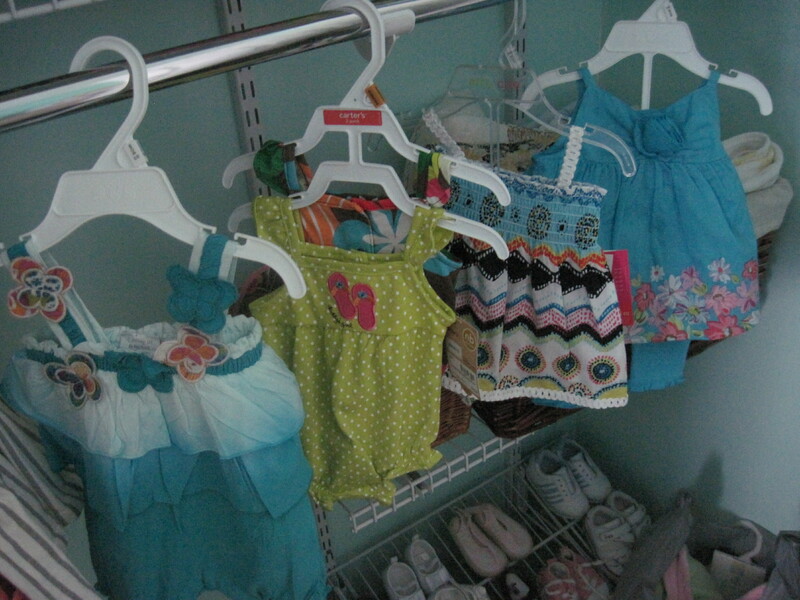 And I buy more cute little outfits. My latest splurges. They are so cute and tiny! I'm really drawn to this pretty turquoise blue for some reason. Ooh! Wanna see her room? Of course you do. Anyway, that’s us around here in the Nevil household. Hanging out, waiting, waiting, waiting. Each moment that passes I try to think, “what would this moment be like with a little baby in the room”. Sometimes I shudder and sometimes I just get giddy. I’m glad that Jesus is holding these moments and all the ones to come! I like the slideshow widget! Very nice. But what I like more is your pastor’s application. Need to remember and use that one. Thanks,Tiffany. I can’t believe you’re about to have a little girl! I’m so excited to see your baby girl! You’re so close!!!! so close…and yet seemingly so far! ha!